Mutual Energy Limited is a private company limited by guarantee, registered in Northern Ireland under the Companies (Northern Ireland) Order 1986. It was formed on 31 January 2005 with the objective of owning and operating energy infrastructure in the island of Ireland for the long-term benefit of the energy consumers of Northern Ireland. The present principal activities of the company and its subsidiaries are the ownership and operation of Northern Ireland’s energy links with Great Britain. Mutual Energy is the ultimate holding company of the group of companies which owns the Scotland to Northern Ireland Pipeline (“SNIP”) and Belfast Gas Transmission Pipeline System (“BGTP”). 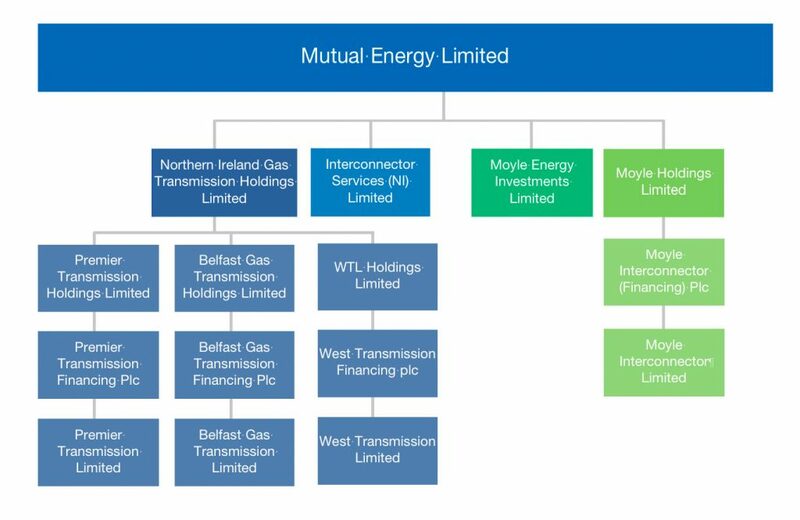 Mutual Energy owns the whole issued share capital of Northern Ireland Gas Transmission Holdings Limited (“NIGTH”), which in turn owns the whole issued share capital of Premier Transmission Holdings Limited (“PTH”), Belfast Gas Transmission Holdings (“BGTH”) and WTL Holdings Limited (“WTH”). These companies own the whole issued share capital of Premier Transmission Financing plc (“PTF”), Belfast Gas Transmission Financing (“BGTF”) and West Transmission Financing plc (“WTFL”) which are the owners of the whole issued share capital of Premier Transmission Limited (“PTL”), Belfast Gas Transmission Limited (“BGTL”) and West Transmission Limited (“WTL”). PTF and BGTF are the vehicles which, through the issue of bonds, financed the acquisition of PTL and BGT, the companies which own the SNIP and BGTP infrastructure assets. Mutual Energy also is the direct holding company of the Moyle group of companies. Mutual Energy is the sole owner of Moyle Holdings Limited (“MHL”), which owns the whole issued share capital of Moyle Interconnector (Financing) plc (“MIF”). MIF is the vehicle which, through the issue of bonds, financed the acquisition of Moyle Interconnector Limited (“MIL”). MIL owns the Moyle Interconnector infrastructure assets. Mutual Energy’s wholly owned subsidiary, Moyle Energy Investments Limited is intended to be the vehicle for acquiring and holding other energy assets and investments. Mutual Energy, previously known as Northern Ireland Energy Holdings was incorporated in Northern Ireland on 31 January 2005 as a private company limited by guarantee. It owns the entire issued share capital of NIGTH. The directors of Mutual Energy are Patrick Anderson, David Gray, Paddy Larkin, Gerard McIlroy, Kate Mingay, Michael McKernan and Chris Murray. NIGTH was incorporated in Northern Ireland on 1 February 2005 as a private limited company. It owns the entire issued share capital of PTH. The directors of NIGTH are Paddy Larkin and Gerard McIlroy. PTH was incorporated in Northern Ireland on 31 January 2005 as a private limited company. It owns the entire issued share capital of PTF. The directors of PTH are Paddy Larkin and Gerard McIlroy. PTF was incorporated in Northern Ireland on 28 January 2005 as a public limited company for the principal purposes of acquiring the entire issued share capital of PTL and issuing the bonds by which it is financed. It owns the entire issued share capital of PTL. The directors of PTF are Paddy Larkin and Gerard McIlroy. PTL was incorporated in Northern Ireland on 9 March 1992 as a private limited company. Its principal purpose is to finance, operate and maintain the SNIP, the natural gas pipe-line between Northern Ireland and Scotland. The directors of PTL are Patrick Anderson, David Gray, Paddy Larkin, Gerard McIlroy, Kate Mingay, Michael McKernan and Chris Murray. BGTH was incorporated in Northern Ireland on 9 January 2008 as a private limited company. It owns the entire issued share capital of BGTH. The directors of BGTH are Paddy Larkin and Gerard McIlroy. BGTF was incorporated in Northern Ireland on 29 November 2007 as a public limited company for the principal purposes of acquiring the entire issued share capital of BGTL and issuing the bonds by which it is financed. It owns the entire issued share capital of BGTL. The directors of BGTL are Paddy Larkin and Gerard McIlroy. BGTL was incorporated in Northern Ireland on 9 March 1992 as a private limited company for the sole purpose of entering into transactions and arrangements related to the Belfast Gas Transmission pipeline which transports the gas landed in Northern Ireland at Ballumford through to Belfast. The directors of BGTL are Patrick Anderson, David Gray, Paddy Larkin, Gerard McIlroy, Kate Mingay, Michael McKernan and Chris Murray. WTH was incorporated in Northern Ireland on 27 February 2017 as a private company. It owns the entire issued share capital of WTF. The directors of WTH are Paddy Larkin and Gerard McIlroy. WTF was incorporated in Northern Ireland on 1 March 2017 for the principal purpose of acquiring the entire issued share capital of WTL. It owns the entire share capital of WTL. The directors of WTF are Paddy Larkin and Gerard McIlroy. WTL was incorporated in Northern Ireland on 17 July 2009 as a private limited company. The directors of WTL are Patrick Anderson, David Gray, Paddy Larkin, Gerard McIlroy, Kate Mingay, Michael McKernan and Chris Murray. MHL was incorporated in Northern Ireland on 8th March 2003 as a private company limited by guarantee. It owns the entire issued share capital of MIF. The directors of MHL are Paddy Larkin and Gerard McIlroy. MIF was incorporated in Northern Ireland on 3rd March 2003 as a public limited company for the principal purposes of acquiring the entire issued share capital of MIL and issuing the bonds by which it is financed. It owns the entire issued share capital of MIL. The directors of MIF are Paddy Larkin and Gerard McIlroy. MIL was incorporated in Northern Ireland on 8th July 1999 as a private limited company for the sole purpose of entering into transactions and arrangements related to the Moyle Interconnector which links the electricity transmission system of Northern Ireland to that of Scotland. The directors of MIL are Patrick Anderson, David Gray, Paddy Larkin, Gerard McIlroy, Kate Mingay, Michael McKernan and Chris Murray. ISL was incorporated in Northern Ireland on 15th February 2006 as a private limited company. The directors of ISL are Paddy Larkin and Gerard McIlroy. MEIL was incorporated in Northern Ireland on 20th September 2005 as a private limited company. The directors of MEIL are Paddy Larkin and Gerard McIlroy.